Carrie May and Mindy McCain combine over 50 years of weaving experience and knowledge to create these unique scarves and shawls. Each fiber artist contributes her own skills to the partnership and works out of her own home studio. Carrie is a self-taught weaver, learning through workshops and from other weavers at the local weaving guilds. 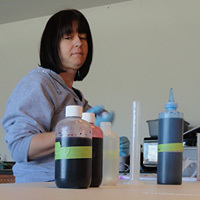 A love of color led Carrie to pursue dyeing yarns for her handwoven fabrics. She studied with Carol Soderlund (Color Mixing for Dyers) and sells hand-painted warps online and at weaving conferences. Carrie also teaches warp painting classes to other weavers. 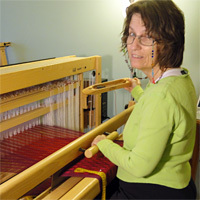 Carrie weaves on a 32-harness Louet Megado dobby loom and a 24-harness Louet Magic loom and is a master dyer and color wonder woman. Mindy started weaving pot holders as a child and has been hooked on weaving ever since. Trained as an art teacher and graphic designer, she is a self-declared computer geek who also designs and produces web sites for other artists. After spending 8 years on the art fair circuit in the 1980s, Mindy took her love of design into visual communication and worked for a graphic design/marketing firm for 18 years before retiring into freelance work. She created and sold handwoven evening bags for several years before joining forces with Carrie to create Loominarias scarves and shawls. Mindy weaves on a 32-harness Louet Megado dobby loom, and manages the business and technical needs of Loominarias.